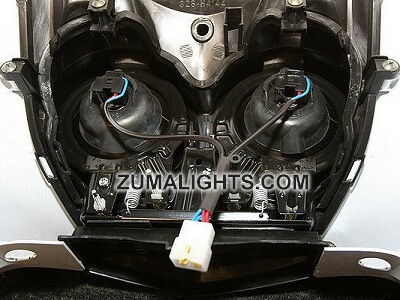 ZUMALIGHTS.COM - Yamaha Zuma 125 Dual Headlight Wiring Harness Kit! We get a lot of questions about whether the 125 harness will cause any problems with the charging system or battery on the Zuma 125. A very large majority of our customers have no problems at all and are very happy with the additional lighting it provides. However, if the average electrical load is larger than the average output of the charging system, or the battery hasn't been properly maintained, the battery will slowly drain. The cause could be a combination of several things such as how frequently the scooter is used, how long and fast it is driven on each ride, the age of the battery, proper first charge of the battery at the dealership, proper storage of the battery when the scooter is not in use, and any additional electrical accessories installed on the scooter. Also if your scooter is in need of maintenance, and doesn't start right away with the electric start, then more frequent use of the starter could drain your battery more quickly. To mitigate the chances of having any problems, some people choose to install lower wattage headlights or install LED bulbs in the turn signals or taillight. Others will occasionally put the battery on a maintenance charger to "top it off". As stated before, most people do nothing and have no problems at all, but if you do have problems, you can try one of the suggestions above or simply return the undamaged harness for a refund. Since the charging system is a permanent magnet type charging system, it is always putting out full power and cannot be "overloaded" or damaged from an electrical load greater than the output. Although we feel the Zumalights Zuma 125 Headlight Harness is a safe modification to the Yamaha Zuma 125, the harness must be installed at the purchasers own risk. Trav, LLC (Zumalights) shall in no event be held liable for any incidental or consequential damages arising out of the use of this product. This product has not been endorsed by Yamaha Motor Corporation and there is no affiliation between Trav, LLC (Zumalights) and Yamaha Motor Corporation. Installation of the product in your scooter may limit or void your rights under any warranty provided by Yamaha Motor Corporation, and Trav, LLC (Zumalights) assumes no responsibility in such event. Our maximum liability to you shall be limited to the amount you paid for the product.